Brave sailors facing the hardships of a long voyage to lands unknown to meet friends unknown for sustenance, valuables and knowledge came to be known as the Hiri. Making a vicious voyage possible was the Lakatoi (Lagatoi), a double-hulled sailing watercraft of Papua New Guinea. They are named in the Motu language and traditionally used in the Hiri trade. In history, the maiden Hiri voyage on a Lakatoi is said to have sailed out of Boera Village to Gulf, thus the Hiri Trade commonly knownto many, formed an important part of the culture of trade by the Motuan and Gulf people. Travelling the harsh weather conditions to trade surpluses of clay pots, Kina shells – mother of pearl shell (oyster shells), Toea shells – cowrie shells in exchange for sago the traditional starch flour (made from the trunk of the sago palm) and knowledge in traditional skills in sustainable gardening, hunting, fishing, building and sailing. 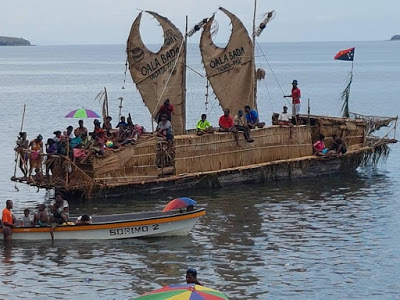 Lifelong friendships were established throughout these voyages and today celebrated every year through the Hiri Moale festivals at Ela Beach, the re-enactment of the voyages of eons. The sailing port was Era Kone, now Ela Beach, the heart of the Motuans’ lifestyles and trading port of call. Today, it is apt that the Apec leader’s summit will be held in the newly built Apec Haus, a building which will rekindle the history of the Hiri trade. Rising from the seas of time, the Apec Haus pays homage to the trade links PNG still thrives on. In the shape of the Lakatoi sail, this building structure will showcase a nation to an international audience. As the Asia Pacific Cooperation leaders week approaches, PNG prepares to provide for our visitors as they are on a voyage to seek a trading partner on our shores. The voyages into our Era Kone has begun with the hosting of the APEC forest Ministers Meeting, Transport Ministers Meeting and the Senior Officials’ Meeting with almost 200 more to come. The Apec Haus is the modern version of brave sailors’ Era Kone for Apec economies travelling to Port Moresby, to our renowned trading spot, to exchange ideas, technology and establish friendships and partnerships for sustainable economic growth and prosperity for the Apec region, a principle of the Hiri Trade. The heads of 20 economies will be here to witness what Papua New Guinea can offer and establish dialogue and understanding on issues affecting the region and to create and sustain the existence of the. Apec forum through policy development. In the years to come, PNG will see fruits of the talks between friends and partners. We look forward to hosting the Asia Pacific Economic Cooperation Leaders meeting in November and the related meetings this year, Papua New Guinea is Apec ready. APEC Mission Statement APEC is the premier Asia-Pacific economic forum. Our primary goal is to support sustainable economic growth and prosperity in the Asia- Pacific region. We are united in our drive to build a dynamic and harmonious Asia-Pacific community by championing free and open trade and investment, promoting and accelerating regional economic integration, encouraging economic and technical cooperation, enhancing human security, and facilitating a favorable and sustainable business environment. Our initiatives turn policy goals into concrete results and agreements into tangible benefits.